'La Roche de Vergisson' is hard to miss when driving south from the Côte d'Or to the hamlet of Vergisson. The massive rock looms over the small town like a massive ship's prow. On almost all sides are some of the finest Chardonnay vines in France – in Vergisson that means exclusively Pouilly-Fuissé (Mâcon-Vergisson 'La Roche' being the only exception.) This is the epi-center for intense, mineral driven French Chardonnay. Location is everything. On a clear day it possible to see Mont Blanc from these rocks. Peaking at 485 meters,, these are the highest altitude vineyards in the entire appellation (which means grapes ripen slowly and retain more acidity in the cooler climate). Everything that is needed to make world-class Chardonnay is found in this town, with all of the vineyards containing about twelve inches of dirt before you hit solid bedrock. Lying in the shadow of this grand rock, is one of the finest estates in all of Burgundy and unquestionably the master of Vergisson, Domaine Daniel et Julien Barraud. With holdings in the BEST and oldest vineyards in the region, the wines are a PhD level course in world-class Chardonnay. The viticultural history of the Barraud family began in 1905, when Jean-Marie Barraud first purchased parcels in Vergisson, the highest point in the Mâconnais. Since that time, Daniel Barraud, along with his son Julien and wife Martine (the master of the vines), have turned his family's domaine into THE benchmark producer of the region and a must-have for all Burgundy lovers. 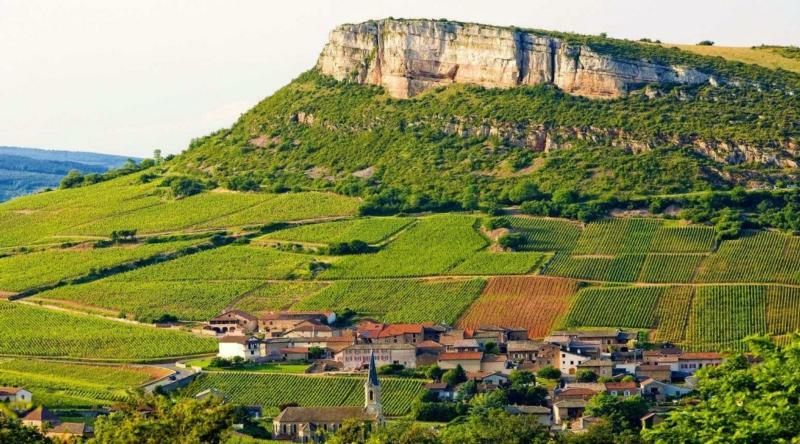 The heights reached by this storied producer mandate that they must now be compared to the best of the Côtes d'Or. This is simply white Burgundy at its finest – and most reasonably priced. Vinous Media 91 "(this is the estate's only Pouilly-Fuissé blend; the rest are from single sites; vinified in fûts and demi-muids, plus 15% cuve; this and the following 2015s had been racked into tanks a week before my visit and were slated to be bottled in November): Full, bright medium yellow. Allen Meadows Burghound 91-93 "This is distinctly backwards and tight with plenty of minerality on the explosive and highly energetic middle weight flavors that exude a mouth coating dry extract before culminating in a beautifully long and moderately austere finish that really fans out. Impressive"
Allen Meadows Burghound 93 "
Allen Meadows Burghound 94 "